When in the summer of 1886 the Twentieth National Encampment of the Grand Army of the Republic assembled in San Francisco, California, there was a natural desire in the community to learn all that was possible about an organization which commanded such unbounded enthusiasm and was so warmly welcomed. The press of the city published voluminous accounts of the receptions of the veterans, the history of the most distinguished among them, and many other interesting items connected with the order. These publications, though elaborate in many respects, reflecting great credit on the industrious, painstaking research of the editorial and reportorial staff, as well as numerous contributors, were necessarily inconvenient for preservation, and there was also much important data which had unavoidably to be omitted for want of space. The great value of these articles of the San Francisco press immediately previous and during the encampment caused the suggestion from many different members of the order that a work which would give in permanent and accessible form a history of the order, the record of the Twentieth National Encampment, and biographical sketches of members of the Grand Army of the Republic was exceedingly desirable and would be generally appreciated. It was under these circumstances that the book was commenced. How far it is a success will be for those personally interested to judge. It will be seen that it is a history of private soldiers as well as commissioned officers, and shows the admirable material of which the rank and file of the armies of the United States in the late Civil War were composed. They came from the different pursuits of life; they largely represented the intelligence, the moral and patriotic sentiment, and the best elements of the social and political system of the country. Great care has been taken to be accurate in all the statements. The data has been obtained either directly from the parties themselves, their friends, official sources or reliable publications. The purpose has been to narrate the facts concerning the military, civil, and Grand Army record of each member, in a plain manner, entirely devoid of coloring. 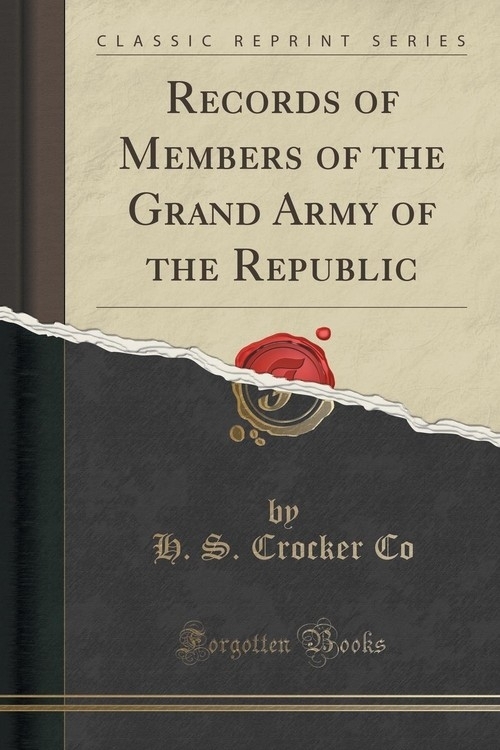 The work is a step towards an encyclopedia of the Grand Army of the Republic, and we trust that many a comrade may find a familiar name in these pages. A second volume of this work will be issued at an early date which will give the history of the Grand Army as it appears herein, and will contain the biographies of other comrades unavoidably crowded out of the first volume. It is but proper and just that acknowledgments should be made to Past Commander-in-Chief Robert B. Beath, G. A. R., of Philadelphia, Pa., for valuable assistance and suggestions in the revision of the History.